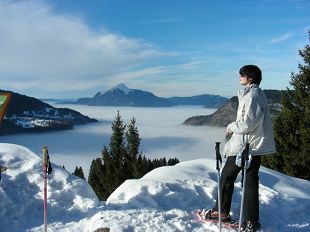 If you are planning a family friendly skiing holiday, 360 Sun and Ski and Les Carroz offers the perfect solution. It is part of the Grand Massif ski area which has over 265km of posted skiing suitable for beginners to experts. We provide a “bespoke” service for our guests. plus many other small services which will make your holiday the most enjoyable possible. Les Carroz is a pretty little French alpine mountain village, 45 minutes from Geneva on the road to Chamonix. It is part of the Grand Massif ski terrain – with skiing up to 2,500m, which means great skiing all season. There are 265km of marked pistes and extensive artificial snow making equipment to augment nature’s own snow! It has one of the best snow records in France. It has a welcoming and friendly atmosphere. Over recent years, it has evolved from a small Savoyard hamlet to a year-round resort, with particular emphasis on the needs and wants of children, but without losing its character and warmth. It is ideal for family skiing and skiing with children. However it’s not just for kids: for grown-ups there are many bars, excellent restaurants, lots of shops and even a night-club. We offer free child places all season and have in-house childcare. We aim to provide the best possible family holiday in France. traditional savoyard chalet is warm, comfortable and fitted out with everything you could need – from baby equipment to spare gloves and hats, sungalsses and even ski clothes! We live in the chalet all year round and as a result the chalet is always well maintained and spotlessly clean. January 2018 – want to take their children out of school for a whole week, we are now offering long weekend ski breaks – 3 or 4 nights. Please call for a price which is dependent on the number of nights you stay – children still stay for free other their food costs as usual. The long weekend breaks are also available for groups of Mums or Dads who want to get a short ski fix! These breaks are available throughout January 2018 – contact us for more information!